The defending World Champions proved way too much for the Ravens yesterday at the Meadowlands, humbling our purple birds 30-10. The Ravens, while a team on the rise, showed that they are not there yet, getting simply outclassed by a better group of players. On the back of Brandon “the juggernaut” Jacobs, the G-Men scored TDs on their first 3 possessions, staking a 20-0 lead midway through the 2nd quarter. That proved too much for even this new look Ravens offense to overcome, especially since they couldn’t put together anything resembling a running game of their own. 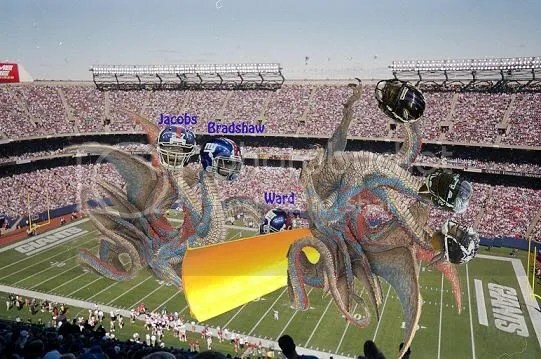 The Ravens version of the 3-headed backfield, which we had thought would be able to match the Giants’ yard-for-yard, was bottled up from the start. Case in point: when Joe Flacco is your leading rusher (57 yards), you probably are not going to win too many games. It will likely be very “coach-speaky,” but it seemed pretty obvious that the staff had already moved their thoughts on to next week’s game against Philadelphia once the score was 27-10. The Ravens are a good team. We’re still convinced of that. The New York Giants are a REALLY, REALLY good team. We are skeptical about that no longer. Since the San Diego chargers choked and couldn’t hold on to a late lead in Pittsburgh, the Ravens once again find themselves 1 game back in the AFC North. On the bright side, 4 of the Ravens final 6 games are at home, so they are still in a very favorable position as the regular season enters its’ final weeks. They failed miserably to announce themselves as contenders to the league, as they had hoped to do, but finishing the brutal 5-of-6 on the road stretch with a mark of 4-2 (4-0 against quarterbacks not named Manning) is nothing to be ashamed of. The Eagles, fresh off a TIE of the Cincinnati Bengals, visit M&T Bank Stadium for the first time in 8 years this Sunday. Let’s all put the stink of this game behind us quickly and hope our boys can regain their winning ways in front of a friendly crowd. This entry was posted on November 17, 2008 at 11:47 am and is filed under Ravens, Ravens Game Recaps. You can follow any responses to this entry through the RSS 2.0 feed. You can leave a response, or trackback from your own site. My favorite scene from this game was when tackle machine, future Hall of Famer, “Ray Lewis” stretched his one hand out to catch Bradshaw and missed leading to a 77 yd rush. BEAUTIFUL! Saying a play by either team, which resulted in anything, was “beautiful,” is a very biased thing to do. No, I am merely giving credit to that unrecognized Giants O-line that gashed the vaunted #1 rush defense for 207 yds. And, to show you how unbiased I am, next week’s score prediction: Ravens 17 Eagles 10 —-Harbaugh’s old team plus Westbrook isn’t playing like a high-caliber back. You forgot *First Ballot* Hall of Famer, and *Best MLB in NFL History. * But yeah, he overpursued like a mofo on that play. The Giants have the best O-Line in football right now. Those groups never get enough credit. Just like last year when everybody was talking about how great Brady and Moss were playing, and not giving a fair shake to the 5 guys that were giving Moss time to get downfield. Westbrook has the ability to beat a team by himself. However, Andy Reid is not using him very well. He carried the ball just 14 times in their game yesterday, despite averaging 4.3 ypc. I saw a stat where the Eagles passed on all 18 of their 3rd downs, converting only 3 of them (and 3 were 3rd-and-1). We’ll get more into that as the week goes on, but Andy Reid and Donovan McNabb are killing what should be a pretty good team. Archie Manning fathered Ward, Bradshaw, and Jacobs?